Kicked off the (Free) Fringe 2015 in style with Comedy Mash at Espionage. Our genial host for the run is Jack Gleadow. Now, in a Fringe world full of bland guys going on about junk food and shopping in Ikea you should never underestimate the gift of funny bones which usually means having an expressive face which looks – you know – funny. So Jack – I’m sure you’ll take it as a compliment when I say you have funny bones. Adding to that a slight air of Norman Wisdom or a northern comic from yesteryear with his flat cap and waistcoat – the guy makes an effort which is always appreciated. His humour is well pitched for the time of the day with jokes about being sponsored by Morrison’s (potatoes, mash… ) with an easy going style essential for hosting duties. I was there on the first day of the run (6 August) and call it luck or serendipity but nearly all the acts were from the north (of England) with Hull, Stoke, Leeds and Salford being represented (Peterborough was the southern most point). Call me biased but give me a northern accent and I’m half way to comedy satisfaction. Good quality from everyone but for me standouts were Jo Darcy with her stories of escaping from teacherdom and confessions of feeling weirdly flattered by the school bad-boy’s crude gesture – all deftly re-enacted showing she has a knack for physical comedy. Other highlight was Red Redmond. A tense wire crackling with nervous energy packaged up as a ‘ginger goth’ (his words). Effective routine about comparing the mean streets of Salford to staying in Leith. There’s also original stuff about life with his pet rabbit. All a refreshing change from the deepfriedMarsBars routines. So full marks to the Comedy Mash for serving up a tasty treat – and not merely reheated leftovers. With a daily changing menu and Jack Gleadow as your maitre d’ I’m sure you’ll be well satisfied. 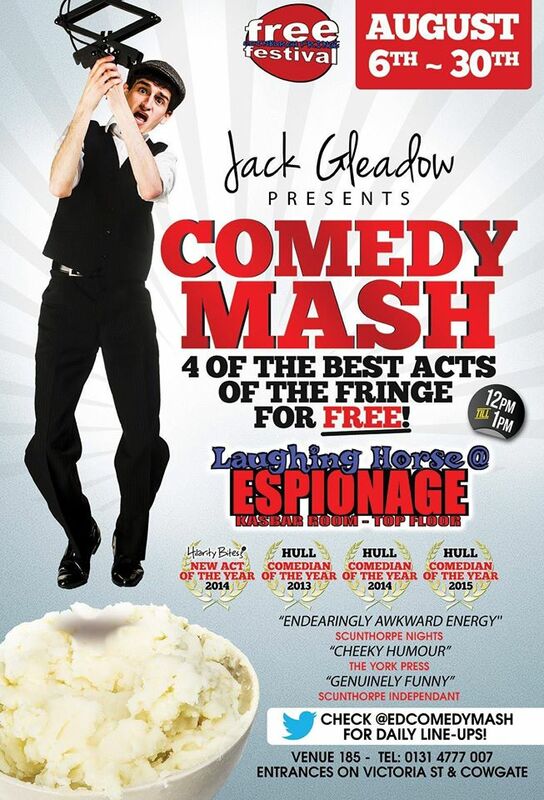 This entry was posted in 2015 Edinburgh Fringe Reviews, Edinburgh - guide to the city and tagged Comedy Mash, Edinburgh Free Fringe, Edinburgh Fringe 2015, Jack Gleadow, Jo Darcy, Laughing Horse Free Festival, northern comedians, northern comedy, Red Redmond. Bookmark the permalink.